Thousands of protesters took over a main square in Bahrain's capital this morning in a bold attempt to copy Egypt's uprising and force high-level changes in one of Washington's key allies in the Gulf. Security forces - apparently under orders to hold back - watched from the sidelines as protesters chanted slogans mocking the nation's ruling sheiks and called for sweeping political reforms and an end to monarchy's grip on key decisions and government posts. The unrest in Bahrain, home to the US Navy's 5th Fleet, adds another layer to Washington's worries in the region. In Yemen, police and government supporters battled nearly 3,000 marchers calling for the ouster of President Ali Abdullah Saleh in a fifth straight day of violence. Yemen is seen as a critical partner in the US fight against a network inspired by al Qaeda. The Pentagon plans to boost its training of Yemen's counterterrorism forces to expand the push against the al Qaeda in the Arabian Peninsula faction, which has been linked to attacks including the attempted airliner bombing in December 2009 and the failed mail bomb plot involving cargo planes last summer. Saleh has been holding talks with Yemen's powerful tribes, which can either tip the balance against him or give him enough strength to possibly ride out the crisis. The political mutinies in the Arab world show the wide reach of the calls for change spurred by the toppling of old-guard regimes in Tunisia and Egypt. In Jordan, hundreds of Bedouin tribesmen blocked roads to demand the government return lands they once owned. Saudi activists are seeking to form a political party in a rare challenge to the near-absolute power of the pro-Western monarchy. Yemen's grinding poverty and tribal complexities also stand in contrast to the relative wealth and Western-style malls and coffee shops in Bahrain's capital of Manama. But many in Bahrain still boiled down their discontent to a cry for economic justice as well - saying the Sunni rulers control the privileges and opportunities and the Shiite majority struggles with what's left over and are effectively blackballed from important state jobs. 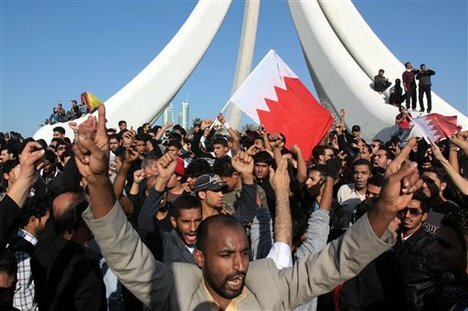 "I demand what every Bahraini should have: a job and a house," said student Iftikhar Ali, 27, who joined the crowds in the seaside Pearl Square. "I believe in change." Protesters quickly renamed it "Nation's Square" and erected banners such as "Peaceful" that were prominent in Cairo's Tahrir Square. Many waved Bahraini flags and chanted: "No Sunnis, no Shiites. We are all Bahrainis." Others set up tents and distributed tea and kabobs for those planning to spend the night under one of the city's landmarks: a nearly 90m monument cradling a giant white pearl-shaped ball that symbolizes the country's heritage as a pearl diving center. Someone used stones to spell out the message in Arabic: "The real criminals are the royal family." There is no direct call to bring down the king, whose family has ruled Bahrain for more than two centuries. But he is suddenly under unprecedented pressure to make serious changes in how the country is run.